We haven't had the best of luck with ducks. The last group that we had relocated to the neighbours farm, likely due to the fact that the fox kept lurking about our barns. They were Indian Runner ducks, and never did really bond to us - in fact they ran from us just as they ran from the fox. Despite my best efforts, the Indian Runners never felt at home here, and so they moved. They are now happy as a pig in a poke, on a great big pond with an island in the middle. We said "no more ducks". So how is it that less than a few weeks later, I find myself with this fellow? He is most definitely a duck. 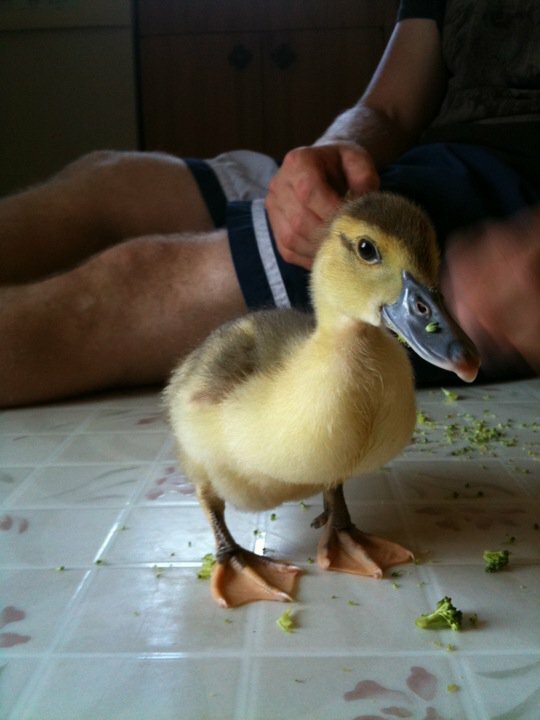 My better half reminded me that we were not going to get anymore ducks. 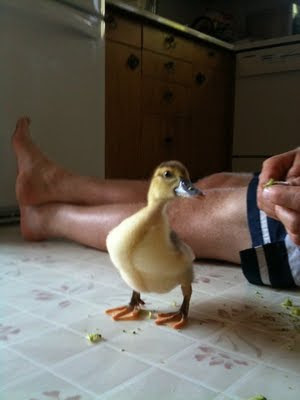 I nodded my head, as I fed the duck broccoli. I explained that the duck was given to us by someone who didn't have acres of green fields for him to run about in, nor did they have a creek for him to splash in. How could I deny the poor duck that opportunity? Some time later, I found my better half sleeping on the couch, with the duck nestled in the crook of his arm. It seems the duck is staying.